Have you ever woken up with a stiff neck, wishing you could get a massage right then and there? One of the worst pains I've ever felt was actually when I woke up one morning a few years back and could not move my neck at all - I was paralyzed for the entire day and was bedridden because of it. Definitely one of the scariest moments I've experienced and I was just about ready to go to the hospital. I resorted instead to compresses and cried in agony (it was that bad) trying to get my neck to move again. Thankfully the mobility of my neck came back on its own by the end of the day, to my great relief. How I wish I could have had a massage back then to bring my neck back to health faster. What's great is that it is now possible to do so at home at a fraction of the price. 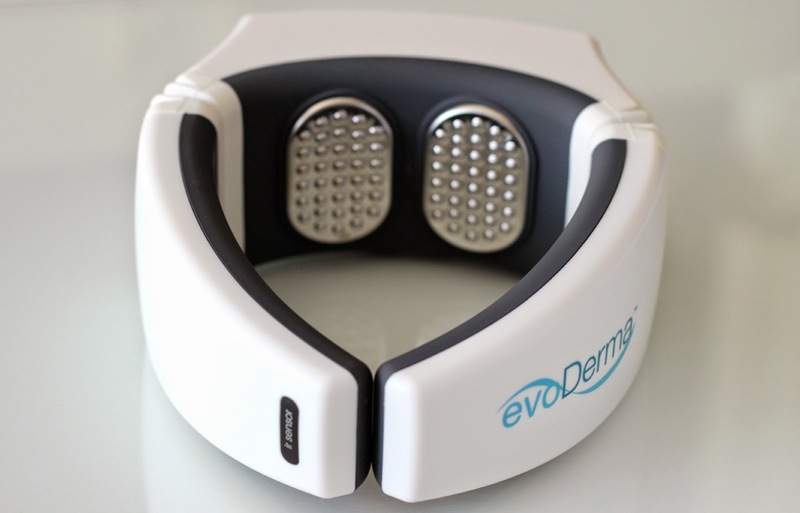 The evoDerma Proneck Massager* works to soothe neck pain and ease tense muscles, improve sleep and reduce stress while stimulating the flow of blood and oxygen. This easy to use, wireless and travel friendly device makes it easy to soothe that painful neck in the comfort of your home. Not to mention it is super affordable and can be shared with others so that everyone benefits. Keep reading for a video demo and also a very special discount code, exclusive to my readers! 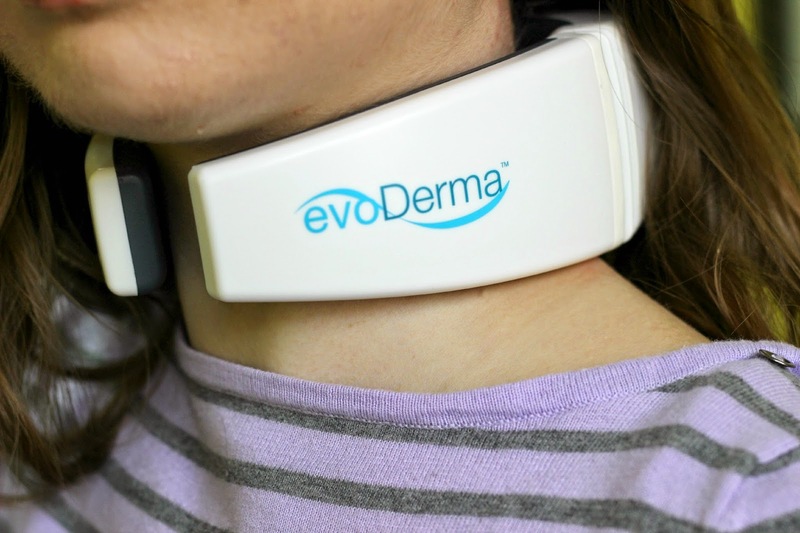 The evoDerma Proneck Massager comes with a neck piece, remote, charger and user manual. The good news is that it really does not take long to understand how the system works. So, how exactly does the Proneck Massager work? It actually alternates between three different techniques: heat massage, vibrating massage and low frequency electric impulse massage. It is designed to take you through six computerized programs, or modes which are preset to make the device easy to use. The neck piece comes with a flexible brace, allowing it to fit any neck size. On the bottom you will find the power/charge switch and charge port, and the screen is equipped with a power indicator light letting you know when the device is in use, charging, or fully charged. The piece has two inner metal plates, which go on the back of the neck and is where you will feel the above sensations. The front of the brace has an infrared receiver window, which communicates with the remote to function. I usually can get 3-4 full uses before having to charge again. The remote (battery included) has a power button as well as a wheel for menu selction, which you can see appear above on the LCD screen. The bottom of the remove is equipped with an infrared emitter window, so that when the remote is pointed straight at the receiver window on the neck piece, there is communication and that is what allows the device to work. 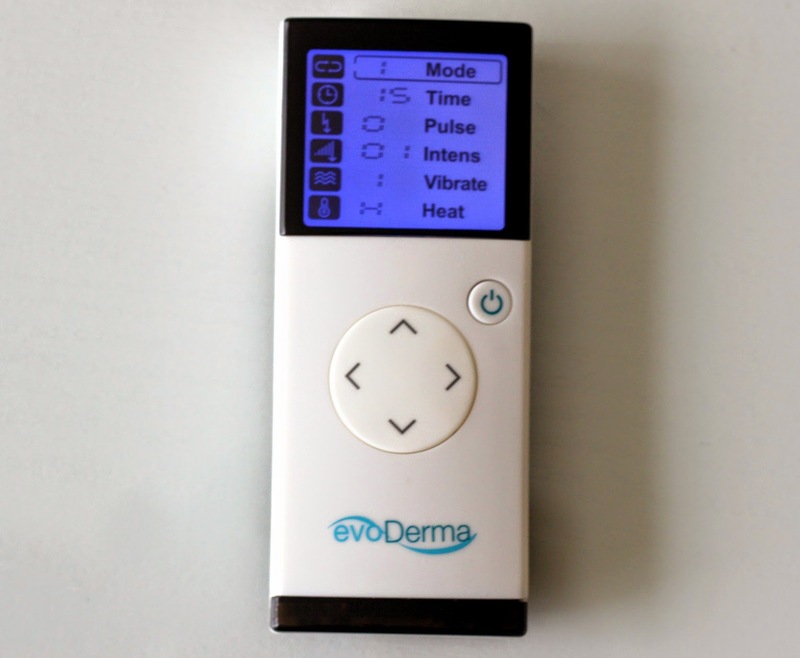 The menu consists of massage modes 1-6: mode 1 uses vibration, heating and electric impulse, mode 2 uses vibration and heating, mode 3 uses heating and electric impulse, mode 4 heating only, mode 5 vibration only and mode 6 electric impulse only. Each mode is 15 minutes, for a total of an hour and a half massage if done with these preset settings. The timer is set for 15 minutes automatically, however it can be change in increments of five, from 5-30 minutes. When in use, the timer functions as a countdown, letting you know how much time is left in each mode. The pulse setitng includes 6 impulse settings, the intensity of the impulse includes 16 levels and intensity of vibration, 3 levels. The vibration includes 6 settings: auto vibration massage mode, vibration only, kneading, tapping, pressing and rolling. The heat setting can be set to 0, low or high. I was surprised by how relaxed I felt even after one use. My neck and shoulders were relieved of tension and I could get my neck to turn at a larger angle than before. I got my mom to try it out as well since she has a lot of neck pain due to a car accident she was in many years back, and she too noticed more mobility in her neck area. Being able to share it with others is really nice - you can easily wipe the inside of the device with a damp washcloth to clean it in between uses. I've been using the device for over a month now, and my neck has never felt as flexible as it is now. I also sleep better and haven't woken up with a sniff neck since. I've enjoyed using it when sitting at my desk while doing school work, or while sitting on the couch doing my readings, since the device should only be used when you are in an upright position. 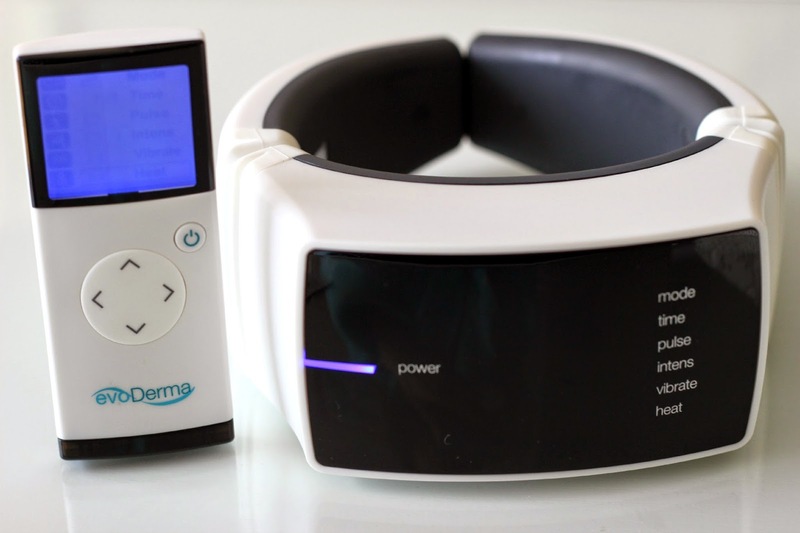 I previously tried the NOOME Anti-Aging Motion device from evoDerma which I still love and use, so when evoDerma reached out to me and asked if I would like to share this device and also offer my readers an amazing discount, I just couldn't refuse. 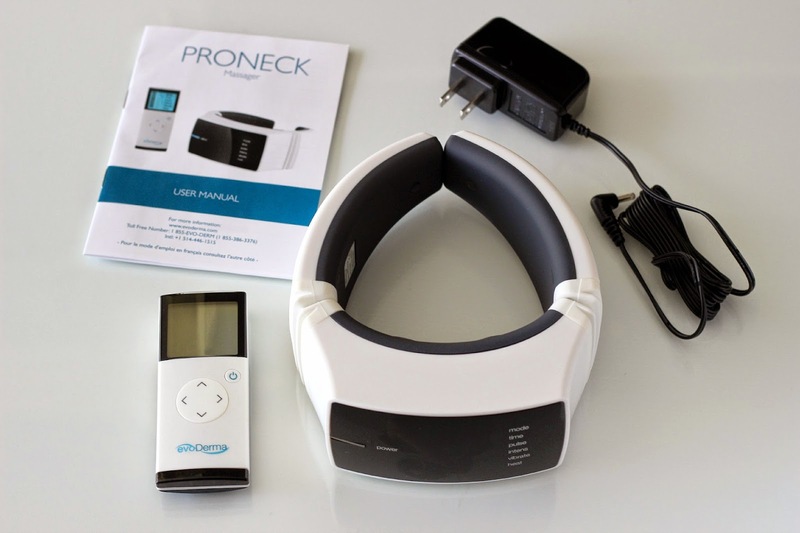 The Proneck massager retails for C$159, but with coupon code LOVESBEAUTY, you can get it for only C$75 - that's over 50% off! I think it's an amazing value for the quality and results, and considering how expensive it is to visit an actual massage therapist, this is a device that will keep on giving long term without breaking the bank. If you are looking for an affordable at home massage, this one is for you! What do you think of this device? Is this something you would use? *Disclaimer: Product was provided and reviewed in accordance with my Disclosure Policy. Affiliate code provided. This sounds sooo good! Looks like a prefect alternative to visiting the expensive massage therapists. I would love to try it out! I would totally use one of these if I had the money!! I would love an at home neck massage so badly.. especially one that I could have all the time! Nice. I have many problems with my sleeping time. I think I should spend a mount of salary of this month for try to use it. This massager works by loosening tight muscles. It proceeds further by improving our blood circulation and addressing directly the trigger points of our body that causes this pain.